Forget the Routan. Meet Atlas. The last time Volkswagen sold a vehicle in the U.S. that was capable of carrying more than five people, it was the Routan. Sold from 2009 to 2014, the Routan was a lightly rebadged version of the Dodge Caravan minivan with a little Fahrvergnügen from Wolfsburg mixed in for good measure. Minivans, though, have been waning in popularity since their heyday in the ‘90s, and the Routan ultimately proved to be a waste of time. The Routan simply delayed what the company should’ve built back in 2009 – this, the three-row Volkswagen Atlas SUV. Like Volkswagen’s current Jetta and Passat sedans, the 2018 Atlas has been designed with American appetites in mind, which means its special ability is size. Inside, it offers space galore for growing families, including a genuinely useable third row. Being built in 2018 rather than 2009 has also given this SUV the latest technologies of our time, both to entertain and keep everyone inside safe. Being a family vehicle, the Atlas won’t win you over with poshness or its ability to induce a grin in turns, but it’s remarkably skilled at the things we used to buy minivans for without any of their stigma. With a base price of $30,750, the Atlas is right in line with other full-size, three-row SUVs. Fully loaded like this with an as-tested price of $49,415, it is a bit more expensive than a similarly equipped Honda Pilot or Toyota Highlander, both big sellers in the segment, but it’s also a newer design and a little nicer inside, so at least you feel the few extra thousand is worth it. As mentioned earlier, the Atlas was designed for American audiences only, like the Jetta and Passat. And like its two sedan siblings, its styling is fairly plain, penned not to offend and blend into suburbia like a She Shed or battery-powered push mower. The Atlas’ aesthetic definitely falls on the masculine side of the spectrum. The simply styled grille and headlight elements form a wide band across the vehicle’s face that emphasizes its width, while more clean character lines streak down along the sides, interrupted only by a pair of oversized, squircle-like fender flares. The look is just butch enough to achieve the reason we all want SUVs – convincing others of our independent, adventurous lifestyle – while at the same time maximizing space inside for the reason why we all need SUVs – handling our dependents and the adventures of family life. The Atlas’ interior scores highly on functionality, but a bit less so on design and choice of materials. It’s perfectly fine for a family vehicle, but the plastics, leather, and faux wood accents in this top-of-the-line SEL Premium model felt below grade for a vehicle costing nearly $50,000. In terms of comfort, though, the Atlas is an overachiever at any price. The seats themselves are great for long hauls on the highway, but it’s the way they move that really makes the difference. The second row slides fore and aft, which means just the right amount of legroom can be dialed in for third-row passengers. It’s one of the few third rows in a full-size crossover SUV that can handle adults without compromise. And if no one’s back there, second-row occupants can slide all the way back for limo-like accommodations, which includes the ability to recline. If kids are your primary cargo, the Atlas also offers three LATCH anchors in the second row for installing a trio of car seats side-by-side. The cupholder count stands at 17, so juice boxes and Big Gulps galore will have a home, and there are USB charging ports for every row of seats. The second and third row of seats also fold flat, and I mean flat flat, to create a voluminous 96.8 cubic feet of cargo space. That’s larger than every competitor save the equally enormous Chevrolet Traverse at 98.2 cu-ft. If it won’t fit in the back of the Atlas, you should probably rent a box truck. Being a brand new vehicle on the market, the Atlas can be had with all the latest gadgets and gizmos. Apple CarPlay and Android Auto compatibility are present, of course, and benefit from a large 8-inch touchscreen with crisp graphics and quick responses. What’s more impressive is the 12.3-inch digital display facing the driver that replaces your traditional analog gauges. Called Volkswagen Digital Cockpit, this screen stretches 12.3 inches and is fully customizable, much like sibling brand Audi’s Virtual Cockpit. The rest of the tech spec sheet is loaded with all the features we expect in a modern vehicle: an upgraded 12-speaker Fender sound system, heated steering wheel, heated first and second row seats as well as cooling on the former, a 360-degree overhead view camera system, and a hands-free power liftgate. 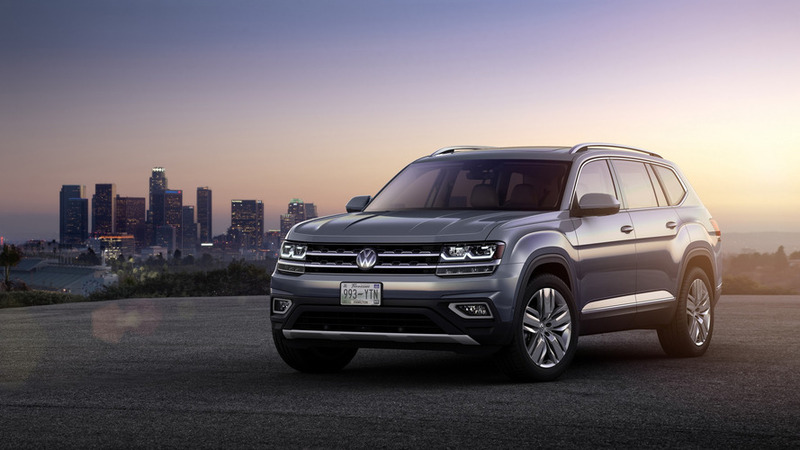 The Atlas can be had with a 2.0-liter turbocharged four-cylinder engine, but the SEL Premium model is only available with Volkswagen’s venerable 3.6-liter VR6 engine. Producing 276 horsepower and 266 pound-feet of torque, this six-cylinder feels plenty strong thanks to peak torque occurring early at just 2,750 rpm. Max towing also stands at 5,000 lbs. – again, competitive. While a few more horsepower would be appreciated, especially when equipped with VW’s 4Motion all-wheel-drive system, the Atlas has no trouble getting up to speed or being called upon to pass. The 8-speed automatic transmission does its job well here, working invisibly and calling up the right cog whether you’re cruising or suddenly need some extra power. The mix of ride and handling here, though, definitely skews towards a comfortable ride. Bumps and potholes are hardly noticed thanks to the forgiving suspension and big tires that feel like pillows on pavement. The downside is felt in the turns, where the Atlas exhibits significant body roll. Its demeanor when driving spiritedly is definitely that of an unwilling participant. That’s not a crime, of course, especially for a large family vehicle like this, yet others in the segment like the Mazda CX-9 and Dodge Durango have managed to dial in some driving enjoyment without sacrificing ride quality. You will be well protected in the Atlas thanks to its state-of-the-art passive and active safety features. Blind spot monitoring and rear cross traffic alert are standard on all but the base model, and forward collision warning, front and rear parking sensors, and lane departure warning come standard on higher trims. The Atlas can also take control in some situations. It offers emergency automatic braking when a collision is imminent, lane assist when you’re drifting out of your lane, adaptive cruise control to automatically maintain safe distances when cruising, and a parking assist system that will steer you into open spots. All of these features come standard on my SEL Premium tester, but they may cost extra or not be available at all, depending on which trim level you choose. One area in which the Atlas finds itself behind the pack is fuel economy. Its official ratings from the EPA for this V6-powered, all-wheel-drive version are 17 miles per gallon in the city, 23 mpg on the highway, and 19 mpg combined. That’s anywhere from 1 to 3 miles per gallon behind the combined ratings of its competitive set. 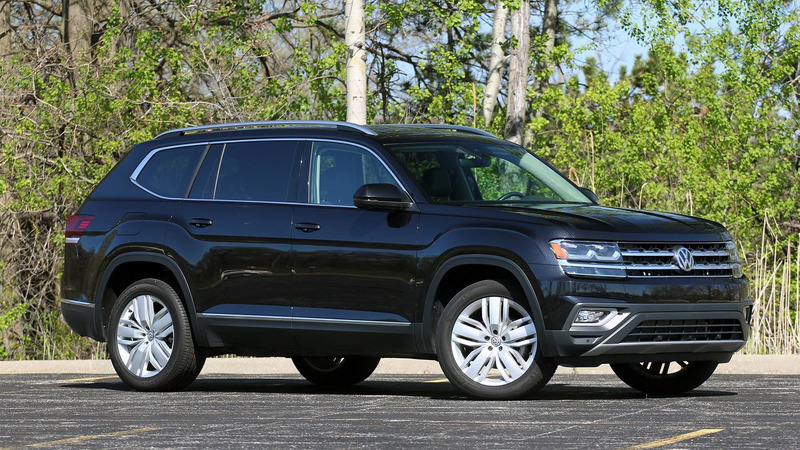 If you drop the V6 in favor of the four-cylinder, and also forego all-wheel drive, the Atlas’ numbers improve to 22 city, 26 highway, and 24 combined – better, but still not great, and VW recommends premium fuel for the four-cylinder. Thankfully, the V6 runs on good old regular gasoline.